Industrias Puigjaner, a company specialised in manufacturing machine-tools for metal deformation by rotational methods, which it markets with the name DENN, is working on the adaptation of its machines to industry 4.0, continuing to seek new applications that might be useful for other sectors where they are not present, and carrying on with its in the mechanical properties of the materials. Industrias Puigjaner was founded in 1885 by Joan Jané Puigjaner, which makes it the oldest machine-tool manufacturer in Spain. It is a family company that has become a benchmark in the world of deformation by rotational methods and that has a clear exporting vocation as shown by the fact that around 95% of its business volume is carried out abroad, especially in the United States, France, Brazil, China or Scandinavia. It has also been present in China, through a joint venture, for the past six years. DENN has a human team made up of 50 people, all of whom are highly prepared professionals who perfectly master the technical aspects related to their activity. In fact, around 50% of the workforce have higher education qualifications. They have a strong presence in sectors such as the automobile industry, industrial ventilation, aerospace industry, boilermaking or lighting. They are all provided with technology to manufacture parts with a high added value, to the extent that their products become more like tools than machines. The equipment is always customised. When a customer contacts DENN, they study his needs and give him advice. After that, they start to design the machine, construct it and later on, commission it and install it. But continuous contact with the customer is always essential for the project manager to give him an appropriate answer to his needs. Innovation is a key element for DENN, earmarking around 7% of its turnover to the R&D department. All that effort is translated into the location of alternative and efficient solutions for its customers’ manufacturing processes and into participation in different European projects (with Airbus or Volkswagen, among others), and the collaboration with different technology centres and universities. DENN’s work, given the evolution of materials, consists in looking for new applications for deformation by rotational methods, which complement other metal transformation processes, such as machining, to obtain quality parts with the mechanical resistance demanded by the market. a reference in this field. 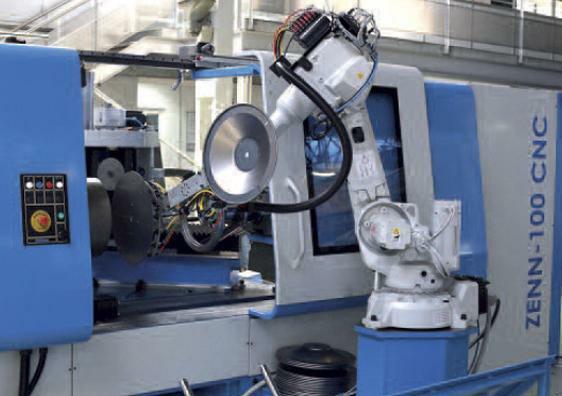 With respect to the challenges in research and development, they have several on-going objectives, starting with the evolution of the machinery they produce to adapt it to industry 4.0, continuing to seek new applications that can be useful for other sectors where they are not present and continuing to research into the mechanical properties of the material. But, above all, they wish to continue collaborating with customers, universities and technology centres to help develop this metal deformation technology.